Narishige DMA-1550: Single-Axis Motorized Stereotaxic Micromanipulator - Tritech Research, Inc.
* The DMA-1550 is a simplified model without a digital sensor equipped on the drive unit of the DMA-1551. * To mount on SM-11, DMA-1510 is required. A motor and sensor incorporated in the drive unit of Narishige's DMA-1550 single-axis motorized stereotaxic micromanipulator enables more accurate positioning of microelectrodes. Using a closed-loop control system to feed back the positional information of the drive unit to the control unit, this remotely-operated micromanipulator allows the user to derive the precise coordinates. Unlike conventional motorized manipulators, the distance actually traveled and the coordinates are shown on the display, whereby precisely controlled movement can be achieved. This function enables the user to set an arbitrary position as a reference point and the display is capable of showing the distance traveled from the reference point set. Position measurement system saves you the inconvenience of calculating the distance traveled, during and after each experiment. An arbitrary distance is configurable in both step drive and free drive. 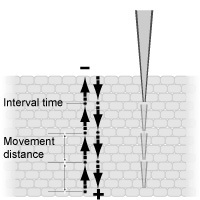 The use of the step drive allows you to advance the microelectrode while checking cells, one by one. This mode allows step/set movement to the upper or lower direction while the operation key is pressed. 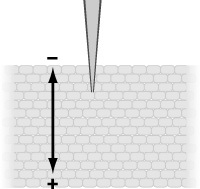 In confirming the position, this mode is useful for advancing an electrode close to the sample. In this mode, a movement distance is set. 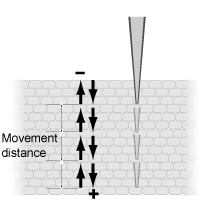 An electrode moves in an upper or lower direction by a configured distance each time the operation key is pressed. This mode repeats a certain distance of movement and interval in turn while the operation key is pressed. In confirming the position, this mode is used for carefully advancing an electrode. 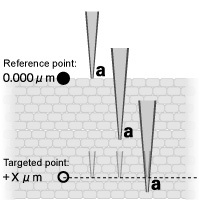 By determining absolute target coordinates based on a set reference point and traveling to those coordinates, the micromanipulator can move the end of a microelectrode to initially set target coordinates regardless of the microelectrode's starting position. When target coordinates (+X�m) are set based on a reference point, the microelectrode travels to the set +X�m coordinates from its current coordinates (a). When attached to SM-15, the Z-axis movement cannot be provided.